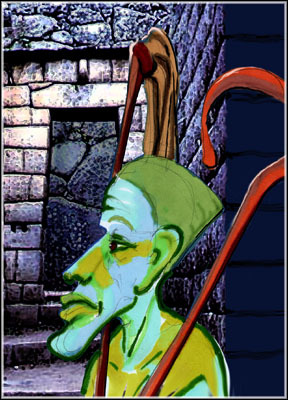 Vexing our neurons, Moses the Egyptian was born with a mission, he was in the right place at the right time with the right combination of passions for all things Monotheistic but he was in Egypt working for the man, the Egyptian King Akhenaten and "inventor" of the monotheist concept, a following based on the Sun God, Rah. 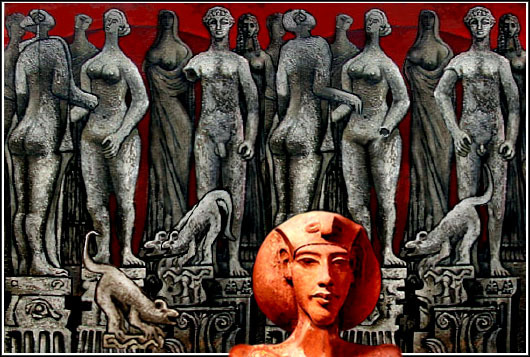 When the dynasty collapsed following the death of Akhenaten, Moses chief priest for the newly fledged theology was a man in limbo  lots of faith and no place to put it, given the Egyptian temperament for as many gods as could be possibly stuffed into one society, Akhenaten's Sun God fell from grace, deemed heretical, Moses was a cleric without a flock, out of work  one God was not enough  cast out of Egypt for apostasy, he was forced into the scrub of the Sinai to ply his art to a nomadic group of goat herders and members of a fractious tribe that craved leadership by anyone that could spin a great yarn. These peoples, the Tribe of Abraham embraced the new pitch, finding the nascent faith simple to understand; God was Bipolar and given to fits of rage with demands of fealty at every turn of the season, a concept the Abrahamians could relate to given the tough love relationship of the Sinai to its people. Moses as it is, made it up as he went along, stacking a doctrine of punitive measures upon his new flock to muster unity and devotion to their new master. The Torah being the purist expression of the labors of Moses, ultimately evolving into Talmudic law, the method for one to reach tribal ascendancy, however, Moses had nothing to do with all the trappings of Jewish doctrine developed by the Rabbinical orders of later Judaism. Moses, the messenger, found the message after a camping trip to Mt. Sinai, starving, he resorted to eating strange berries while breathing smoke from the burning brush of his camp fire  many visions occurred, providing great material for his monotheist notions. Upon return to his flock, having fresh permission to expand his vision with yet more insight into the needs of his charge, he dispensed his revelations to the faith-starved tribe with messianic abandon. Looking into the eye of Yahweh is a tough act to follow. The rest is history, however one cares to interpret the runes. pensive day, Goats not milked: Charlton Heston is Moses. Moses feeling the blessing of doubt, seeking guidance on a pensive day, looking for someone to lead, needing someone to follow  goats not yet milked  Not Happy. A nagging question confronted by contemporary theologians, the cause of much gnashing of teeth: "Did Moses really look like Charlton Heston?" The Answer: Within the paradigmatic constructs of contemporary existence, within a postmodern, post-high-postmodern, modern, futurist, and liturgical paradigm, Moses and monotheism no longer hold the interest to one who realizes life is nasty nasty nasty and we thank god that it's short so as to limit collateral damage. We pass on our social successes to our future selves self-organized to support the meritocracy. Moses could not find relief from guilt but "we bearers of arms and iPods" can reconcile all for the sake of willful ignorance and having lots of stuff. The provisional authority over possessions salves us from agape. The Inuit greet by saying, "life is hard," Moses, not Charlton Heston, would agree. Nagging Questions deserve nagging answers.